This recipe is the Cook’s Illustrated take on Pasta Primavera. The preparation is similar to risotto – the dry pasta is sauteed in oil first, then simmered in just the right amount of liquid. 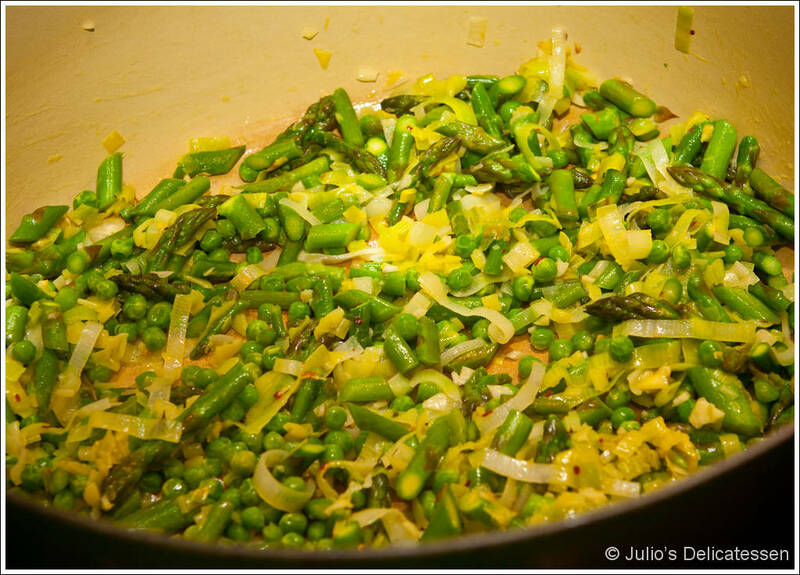 40 minutes before you want to eat – Prep the broth – place the chopped leek and asparagus scraps, ½ of the garlic, 1 cup of the peas, the broth, and the water into a saucepan. Turn to high heat; bring to boil, then reduce heat. Simmer for 10 minutes. Strain broth through a mesh strainer, pushing on the solids with a spoon to get as much liquid and flavor as possible. You should have about 5 cups of liquid. If you have less, add some water to bring the total volume to 5 cups. Discard the solids from the strainer and return the broth to the saucepan. Keep on low heat. 28 minutes before you want to eat – prep the vegetables – heat 2 Tb of the oil in a dutch oven over medium heat. Add the sliced leeks and some salt. Cook for about 5 minutes, stirring occasionally. Add the asparagus to the pot and cook for another 4 minutes. Add the remaining garlic and the pepper flakes and cook for about a minute. Add the peas and cook for another minute. 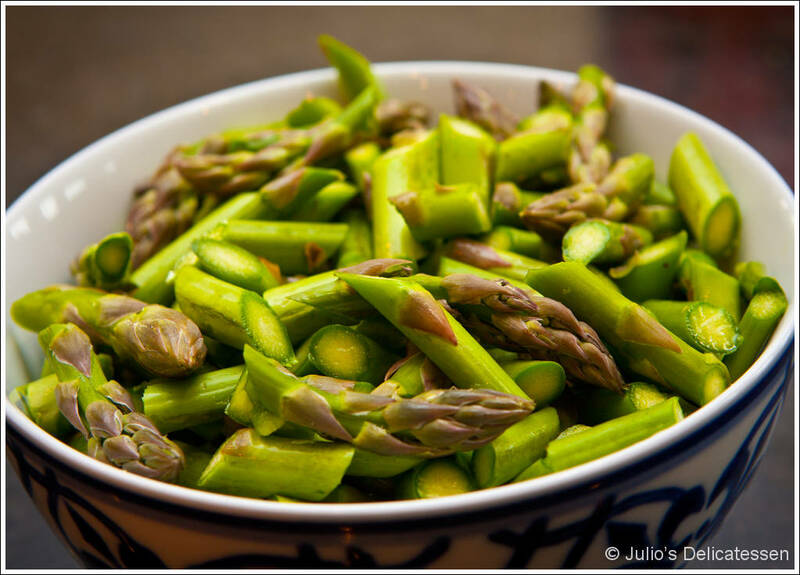 Transfer all of the vegetables to a plate and allow to sit – uncovered – while you prepare the pasta. 18 minutes before you want to eat – cook the pasta – wipe out the dutch oven, return to medium heat, and add the remaining oil. Add the dry pasta and cook for about 5 minutes (until pasta is beginning to brown) stirring constantly. Add the wine and continue cooking (and stirring) until the wine is absorbed. Add the warm broth and turn heat to medium high. Bring the pot to a boil. Continue cooking and stirring until liquid is absorbed and pasta is cooked. Remove from heat and add the lemon juice, parmesan, cooked vegetables, half of the chives, half of the parsley, and half of the lemon zest. Season with salt and pepper. Stir to combine. Garnish with the remaining herbs and lemon zest and serve immediately. I love, love, love, this time of year. 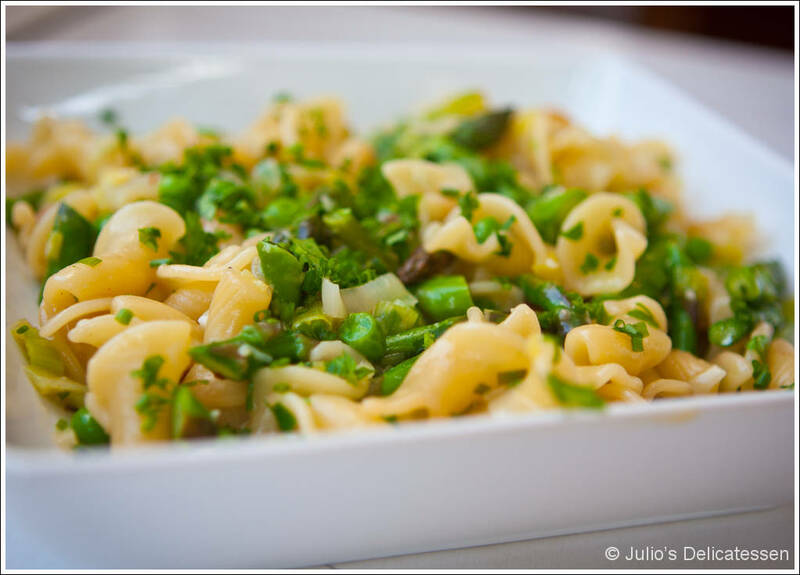 Fresh pasta with fresh veggies…divine! This looks divine. I’m thinking only a garnish of apple smoked bacon could do it justice.